A few weeks ago, I shared some tiny homestead plans that are 1 acre or less. 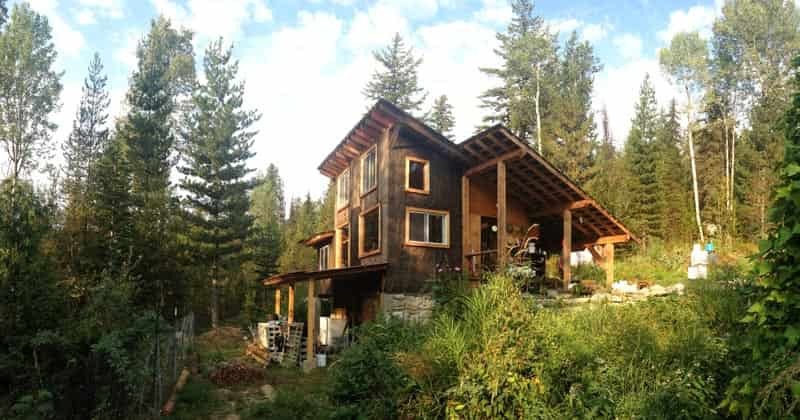 Likewise, Jacob has a post about off-grid homes that you can get today. 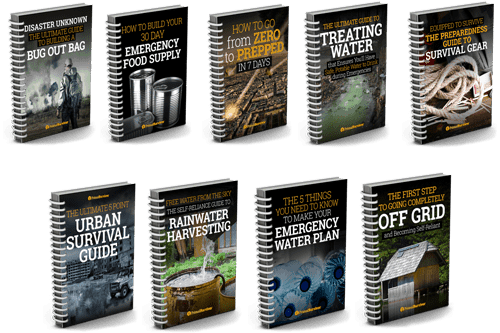 These plans are great because they show you how little land you need to become more self-sufficient. But what a lot of would-be homesteaders want to know is this: exactly how much land do you need to be 100% self-sufficient? What Does Self-Sufficient Even Mean? Before I give you the exact number of acres required to be self-sufficient (and don’t worry, I will! ), let’s first define what “self-sufficient” even means. A type of sustainable living in which nothing is consumed other than what is produced by the self-sufficient individuals. Yes, this definition is in line with what most people think of when they hear self-sufficient homesteading. They imagine the pioneers of old who made everything themselves and were miles (if not days) away from their nearest neighbors. 100% self-sufficiency is a fantasy. I’m not trying to burst anyone’s bubble. And there most certainly are families who live 100% off the land and produce everything themselves. The only encounters I’ve had with completely self-sufficient peoples were tribes in the jungles of Peru (I spent one youthful winter trekking there). And, again sorry to break your bubble, but those people were dying from weird parasite infections and the infant mortality was crazy high. Not exactly the idyllic life we associate with self-sufficiency! One of the biggest myths about self-sufficiency is that you’ll never have to buy anything. This is simply not the case. Unless you are prepared to live like a caveman, at some point you are going to have to use money or the trade economy. Even the pioneers weren’t completely self-sufficient. They would trade with neighbors or go to the local trading post. Or, as I learned from reading Laura Ingalls Wilder books, they’d wait for the yearly visit from the traveling salesman so they could buy shoes. If he was late, they just went barefoot. There is no shortage of blogs which tout how they achieved “complete self-sufficiency” on just a small amount of space. I love these blogs as they are inspiring and have lots of great tips. But, when they say they’ve achieved “self-sufficiency,” what they really mean is that they are able to produce excess food, sell it for cash, and use this cash to buy other things they need. This is a noble accomplishment and by no means should it be negated. 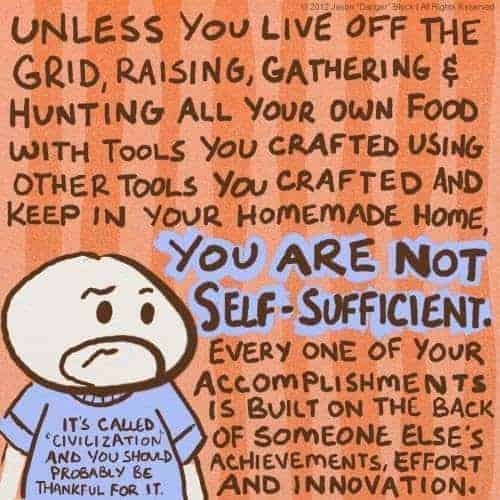 However, claiming that they are “self sufficient” ignores all the hard work that other people did to make the tools and supplies down the supply chain. Even if it Was Possible, Would You Really Want to Be 100% Self-Sufficient? 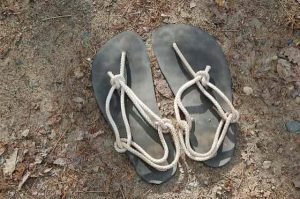 I once tried to make a pair of sandals from cloth thongs and discarded tires. After a few hours of work, I gave up. Even then, I wasn’t really starting from scratch. A factory had made the tires and another factory had made the cloth… not to mention the needle and thread I was using or the razor knife I used to cut the rubber. And that’s just footwear we are talking about. Let’s consider some of the other leaks in self-sufficiency. Spin wool into yarn, and wear nothing but (itchy) wool socks for the rest of your life? Just because 100% self-sufficiency isn’t realistic, it doesn’t mean you can’t strive for it. But before you set off, you’ve got to figure out your goals. To live completely off-grid and produce all your own power? To produce all of your own food? To get rid of all “costs of living” associated with modern life, such as utility bills, grocery bills, childcare, and the cost of commuting to a job? To make your own supplies, such as clothes and tools? That last one is going to be tough. I mean really tough! Running a sustainable farm is hard enough without having to spin your own flax thread into fabric for clothes! So, realistically, self-sufficiency probably is going to mean being FOOD self-sufficient. How Much Land Is Required to Be FOOD Self-Sufficient? The climate of where you live. How much sunlight the property gets. What you grow and raise. Depending on whom you ask, you’ll hear numbers as low as ½ acre of land to be self-sufficient all the way up to over 50 acres. 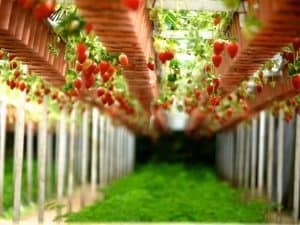 According to the Food and Agricultural Organization, the minimum amount of land needed for self-sustainable food in North America or Western Europe is 17 acres per person. This number assumes absolutely no land degradation, crop failures, or waste. An infographic by 1BOG.org breaks it down to about 2 acres of land for a family of four. This includes approximately 12,000 sq. feet for wheat, 65 for eggs, 2640 for corn, 100 for dairy, 207 for meat, and 77,000 square feet for vegetables. An older study from 1994 estimates 2 acres per person to sustain the standard American diet. Proponents of aquaponics say that 90% of our dietary needs can be grown in 50 square feet. John Jeavons of Grow BioIntensive says that a vegan diet can be grown in 4,000 square feet. 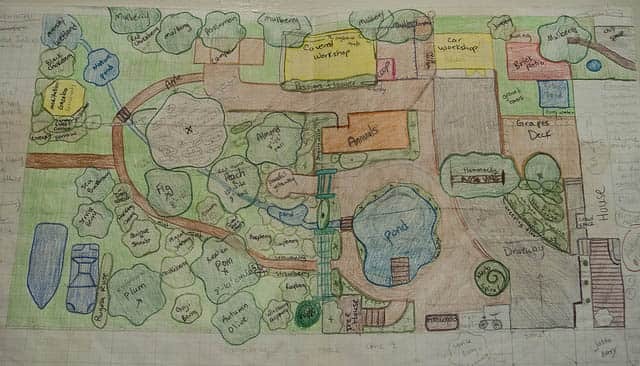 Permaculture advocates say that ¼ acre per person is adequate when permaculture is combined with poultry, fruit trees, and possibly aquaponics. 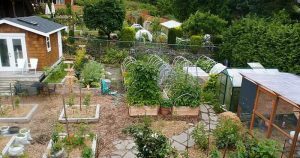 Clive Blazey in his book The Australian Vegetable Garden claims that 42 square meters of space is enough to support four people. John Seymour in his book The New Complete Guide to Self-Sufficiency says that 5 acres is enough to be food sufficient in high-rainfall areas of the UK. Even though a lot of those sources put the number at a lot less, the general consensus is that you really need at least 5 acres of land per person to be self-sufficient. And that’s assuming you have quality land, adequate rainfall, and a long growing season. Oh, and that’s also assuming that you are mostly eating a vegetarian diet. You probably didn’t know this, but meat used to be a luxury which people only ate on Sundays! If you want meat in your everyday diet, you are going to need A LOT more land to be self-sufficient. With livestock, you’ll likely need at least 30 acres. You don’t actually need that much space for livestock to roam. However, as Ken at Modern Survival Blog points out, you need extra land so you can rotate their pastures. For whatever reason, those websites making claims like “you only need ½ acre to be self-sustainable” fail to mention pasture rotation! Thus, if you are going to have cattle, sheep, or goats, you are going to need at least 30 acres for pasture, feed crops, and your veggie crops. 50 acres is probably more realistic though. Invest in more land now because a larger homestead is cheaper build up. The smaller your land is, the harder it is to design. You can’t just say “Let’s just put that crop over there” when there is no “over there.” Every single choice you make – from species selection to crop orientation – is significant. This makes the learning curve of small-acre homesteading a lot higher. There’s no wiggle room. You’ve got to have seedlings ready today to occupy any empty space. Your fences need to be amazing so predators don’t eat your poultry. Those canning jars need to be ready before your fruit rots because every single peach needs to be sold if you want to be able to buy wood for heating this year! Is there anybody out there on a small acreage, able to raise 90% of their own food for the year, that hasn’t spent thousands of dollars on fancy hobby farm equipment? By contrast, if you buy a larger parcel of land now, you have a lot more room for error. You have lots of wiggle room to design your homestead how you want. And you can gradually invest in the systems and knowledge which will truly make your land self-sufficient.With limited space, every choice is significant! 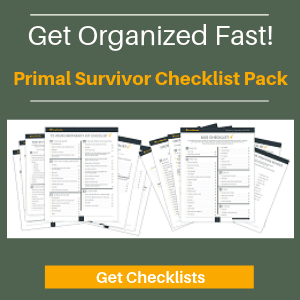 One of the issues I have with the prepper community is that it often promotes the “lone wolf” mentality. You know what I’m talking about – a person (almost always a guy) taking off into the wilderness and surviving with just the bare necessities in his Bug Out Bag. In reality, that guy by himself probably wouldn’t survive for long. Eventually, he’d have to team up with others… or be content with eating bugs in a dank cave for the rest of his life. While it is great to work towards self-sufficiency, the reality is that no man is an island. As humans, we are stronger when we work together. If you really want to be free of all of the traps that come with modern living, then build a community of likeminded people. I see much less need for self-reliant people who can do everything themselves, and much more need for self-reliant communities, where not everyone knows how to weave or farm, but there is clothing and food for all. So stop sweating about how much land you need to be 100% self sufficient. Instead, start learning ONE skill that you are really, really good at and would be valuable to others. Then start finding others like you with diverse skill sets. 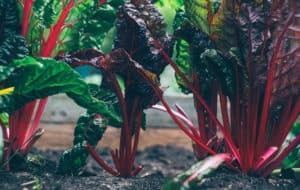 Do this and you’ll find that practicing self-sufficiency on the homestead doesn’t just connect you more to the land, but also to your community. 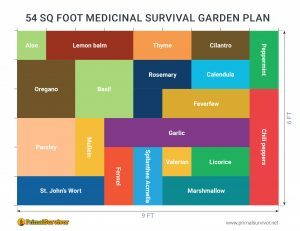 Are you raising your own food? How much land do you have and what does it reap? I like this article. The only change I’d make is in the formatting. I’d put the section on community first & foremost. Even the most sociopathic mountain man looked forward to the yearly rendezvous, & he didn’t live alone very long either. He usually had a country wife or two (AmerIndians). Recall that the sadistic Liver Easter had a wife. Really, who wants to be alone all the time? As for hunting– forget it. If there’s a real TEOTWAWKI, the animals that are left will be hunted out in a matter of weeks. Or does everyone think there are billions of deer & antelope & elk & moose to be had for the taking? Then there are the other predators that are far more efficient at hunting than puny man. You’ll be eating worms & grubs & roots, & you’ll be getting sick. A lot. No community=No survival. Even monkeys know that. I know, Liver EATER. It’s not even 7 AM, I haven’t finished my coffee, & my old eyes are failing. That’s my excuse. Hmph! I know the feeling, pre-coffee is not a good time! Thanks for the comment. Bloody good read..great to present a reality of this planet and resources..there are too many human beings!! And ..community…like minded humans critical to survival. Good balanced words and thoughts. Is it american based?each country has a different wealth. Our aboriginal people…..had a wealthy, balanced , healthy plan firmly in place..before it was foolishly ammended a coupla hunded years ago….did the american indians have it the same wisdom taken ? They were all community based self sufficient survivors who added value to planet earth . I think…we need to relearn that. If i could teach my children how to grow enough vegetables and fruit with a high vegetable protein source of interest…for themselves and 2 others…that is a start!! When i learn……that will help!! You say “eating bugs in a dank cave” like it was a bad thing. This article is jaded. You can live 100% self sufficient. But it’s not practical to do so, cause some items are too cheap there is no point producing from scratch. The main thing is that you can easily be 80% self sufficient for a family of 6 with an eighth acre of land. WHo cares about reports from Food and Agriculture. Learn on your own how small families product an amazing amount of food on a small lot of land. If you expect to eat meat for every meal, then that’s not realistic. But you don’t really need meat. You can do just fine on 95% vegas diet. We did it for thousands of years. In fact we did not eat much meat in our hunter gather period. We make very similar points in the article about 100% self sufficiency being impractical for most. Also mentioned is the meat eating, a mostly plant based diet simply requires less space.